Hello fellow doll enthusiasts! 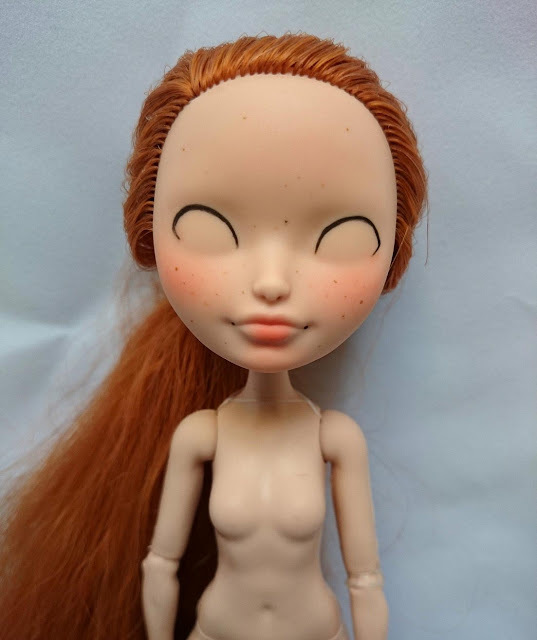 I'm Charlotte, and Emily has very kindly given the opportunity to share some of my repaint tips and techniques with you all. I've only been repainting for a couple of years now so I definitely don't know everything yet, but I feel well-qualified to give you a beginners' course in the subject. 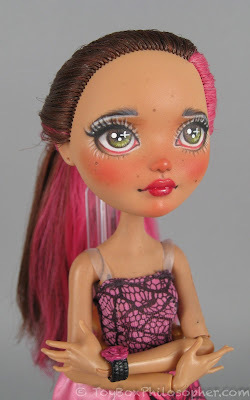 This post is going to - hopefully - give you some basic tools to repaint a vinyl-headed doll. 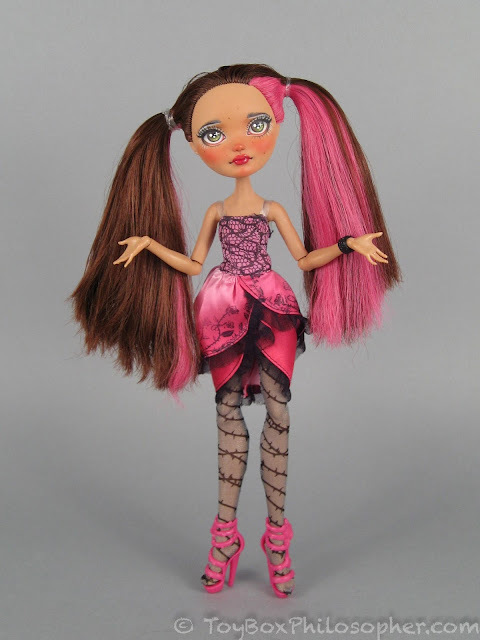 I'm using an Ever After High doll, but you could use Monster High, Barbie, Tonner, whatever you want. Be careful not to follow these same steps if you have a hard plastic doll, as some items I recommend for vinyl will affect plastic negatively - acetone basically melts plastic. First of all, you are going to need what feels like an incredible arsenal. My key kit is comprised of a vast amount of watercolour pencils, a large tube of white acrylic paint, and a selection of pink and brown pastels for blushing and eyeshadow. I personally do the vast bulk of my repaints entirely in pencil, but a lot of people prefer doing them in acrylic paint. I find that I can make much more nuanced lines and colours with pencil, but that might just be because I'm not particularly accomplished at acrylic painting. For tools, I use a lot of brushes of varying sizes, and they were pretty cheap ones. 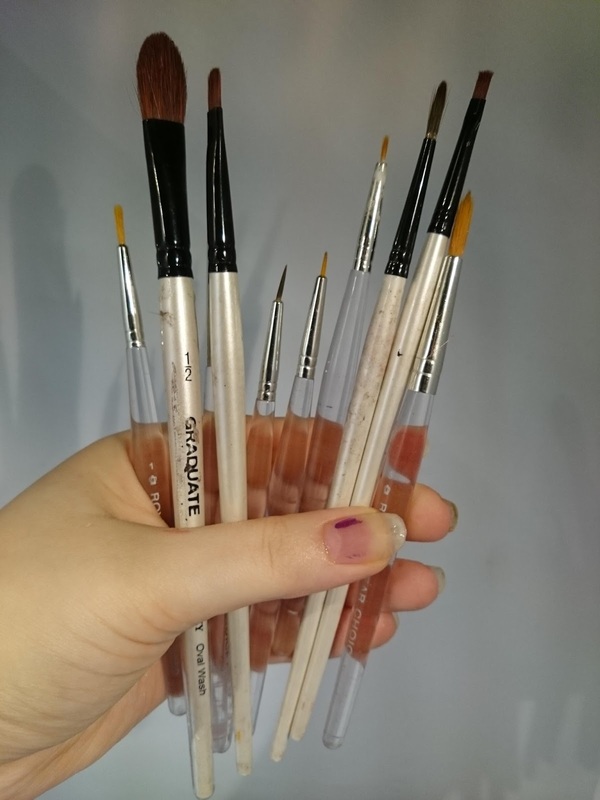 Because I've been a penniless student for the last three years, I essentially picked up the cheapest brushes I could without them being utterly useless, but if you can afford some lovely ones, go nuts! Discussing sealant deserves its own paragraph...or four. I use Mr Super Clear Flat. The 'flat' translates to 'matte'. You can get a gloss version but if you put that on face-ups it just makes them look really sweaty and it doesn't look good - unless that's what you're going for. I believe it was actually formulated for resin ball-jointed dolls but is great for vinyl, plastic, whatever. It's excellent. It is very toxic, though, and you need to be sensible when you use it. You must use it in a well-ventilated room and you ideally need a respirator. Those little fabric nose/mouth covers don't protect against aerosol droplets, so you need something more hard-wearing and specialised. I'm not the best person to ask about what kind of respirator to purchase, but doing a bit of Googling will give you the information you need. Mine cost about £15 and apparently also protects from viruses and bacteria, so I am not just protected against sealant, but also the world's next great pandemic. Very useful. 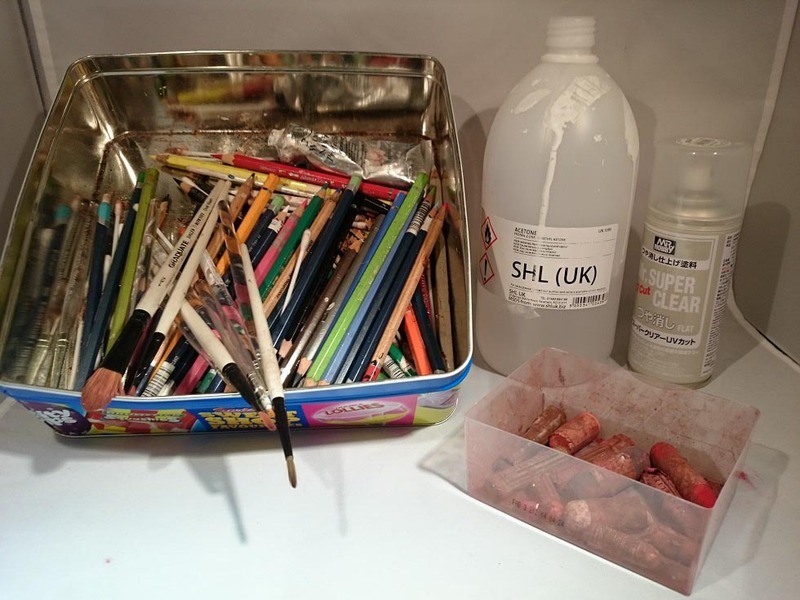 Sealant is also important as a base for any watercolour pencils. Without the tooth of a sealant to draw on, watercolour pencils don't make any mark on the vinyl. If the toxicity of MSC bothers you, there are alternatives, but it can be more expensive. Liquitex does a matte brush-on sealant, but brushing it straight onto penciled heads is going to do more harm than good, and smudge all your work. So really you'd need an airbrush, which is a really expensive investment. I actually do have an airbrush, but I still prefer using MSC. Aside from the toxicity of MSC, it's quite a temperamental sealant, and doesn't react well to moisture of any kind, or cold temperatures. It usually needs to be warmed before use - very carefully! I put mine in a bath of hot (but not boiling) water for a few minutes. Be careful not to get it too hot. After I take it out of the water, I give it a good shake for a few minutes just to get it really nice and ready. 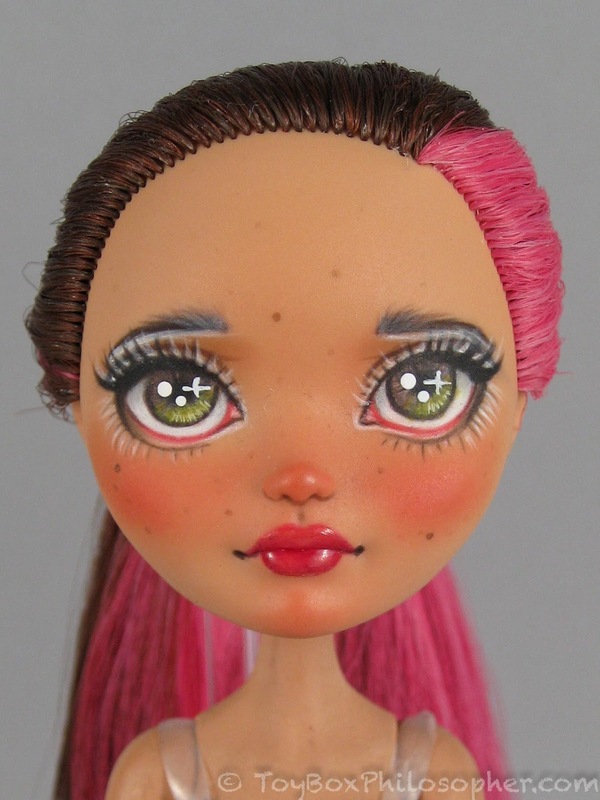 To finish off the doll, I like to use a gloss sealant on the lips. A lot of people like to gloss the eyes as well but I personally find that glossing the eyes can obscure some detail - but that's just me. I use Liquitex gloss, which is lovely and transparent and high-gloss. It can attract dust, but a wet cotton bud usually removes it. So to start off, you will need to remove the factory paint. As mentioned above, I use pure acetone. It will probably take quite a few cotton buds to get rid of all the paint, and I only stop when the cotton bud is coming away totally clean. 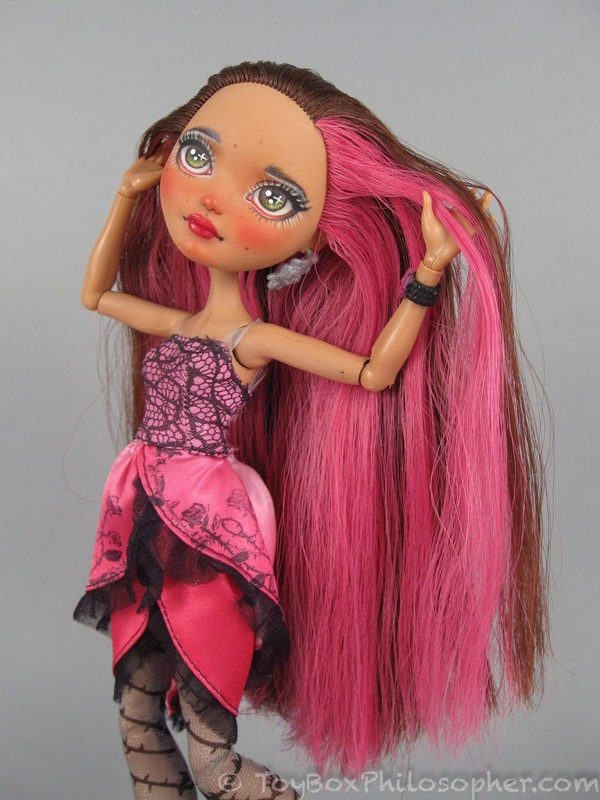 You might want to tie back your doll's hair and cover their clothes with clingfilm or foil or whatever. I do undress them but their little necklaces often refuse to sit right after I've taken them off, so sometimes I just keep them on! Getting sealant on doll hair makes it kind of gross and looks almost like dandruff. The residue comes off pretty easily with a bit of acetone but it can be a nuisance to be cotton budding doll hair when you could have just covered it with a bit of clingfilm. Speaking from experience here. Some people like to have doll concepts in their mind before they start, but I tend to work more organically and just kind of have a vague idea. 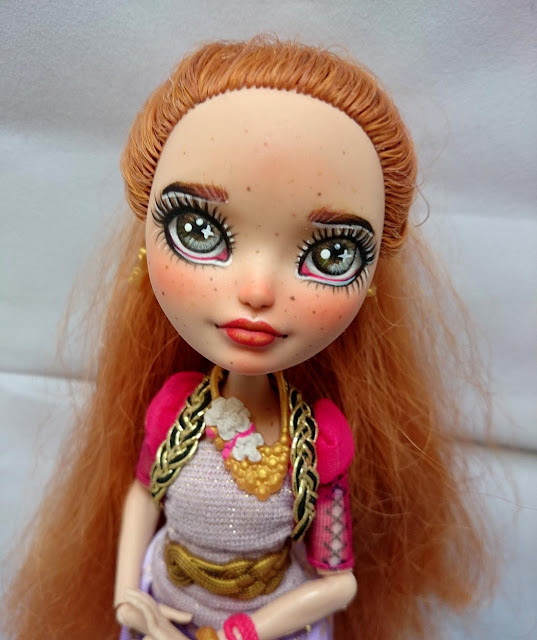 For this doll, Holly O'Hair, her red hair and pale complexion demands some cute freckles, so I know I'm going to give her freckles. Her colouring reminds me of pre-Raphaelite paintings, so in keeping with this sort of arty theme, I don't want to make her look too modern and edgy. Otherwise, I'm just going to see what happens! Before starting anything, I seal with MSC, and leave to dry. The MSC doesn't take very long to dry - I usually leave it about 5-10 minutes, depending on how it looks. You'll be able to tell when it's dry because the whole face will be matte. For the first layer, I start off with a basic outline of the eye. It doesn't have to be particularly neat as it will be worked over a lot, but you want something fairly even, and the line shouldn't be too thick, especially for the inner eye. I start off like this because I find eye shape one of the hardest things to get right, and it's heartbreaking to totally mess something up at the final stage because when you're repainting it probably means you'll have to start over! While I've got the black pencil out, I add lip corners. Just two black dots at the side of the lips to add depth and the illusion of shadow. The final thing I do on the first layer is put down a layer of pastels. To get the pastels ready for application, I scribble on a bit of cardboard and then use a medium-sized round paintbrush to pick the pastel dust up. I shake off the excess, and then apply it to cheeks, forehead (gently! ), chin (also gently!) and to the lips, with a smaller brush, focusing in the middle of the lips. Because Holly's going to be very freckly, I dotted some quick freckles over the top in brown pencil. If you're going to do freckles, don't feel that you should make them too neat and even - freckles aren't like that on human faces. The first layer is - for me, at least - not anything impressive; it's about getting the basic shapes and colours down. I seal for the first time after putting down the pastels, because pastels smudge really easily. For the second layer, I start building up the eye. This starts by simply colouring in the sclera. It doesn't matter too much if the white is streaky in parts as it's mostly going to be covered up by the iris. I generally do a few coats of white between sealant coats to get a good even colour. While I've got the white pencil out, I also begin to build up the lips by gently penciling in her cupid's bow highlight. This helps to give her lips more of a defined shape. 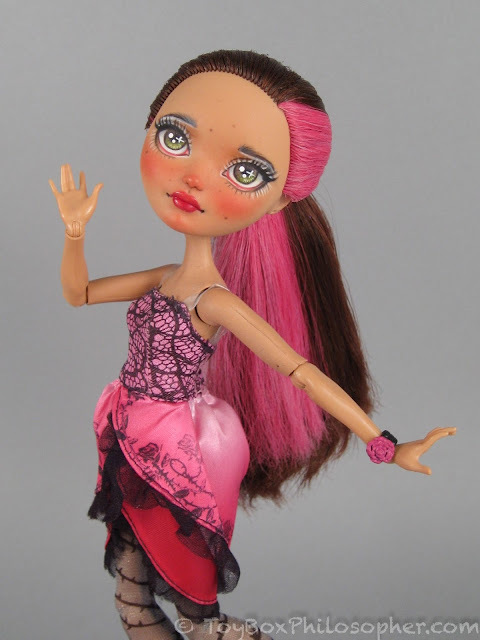 I draw the waterline in pink or red depending on the doll's colour scheme. Holly's is pink. The waterline usually isn't entirely straight, and lifts up a little before the round sweep up to the upper eyelid. Under the waterline, I like to draw a thin white line to act as a highlight. It goes about halfway across the eye. I draw the eyelashes in black for more of a 'wow!' factor but I've seen nice repaints using more natural browns and reds, too - it depends on personal taste! Remember that eyelashes are thicker towards the outer eye, and smaller and thinner towards the inner eye. You can play around with eyelashes for added drama; you can draw them super long and thick or even stick some fake ones on. Next I start blocking in more shapes in the eye area, including eyebrows. Eyebrows are very expressive - you can essentially give any expression to any face scupt by changing the angle or height of the eyebrows. Holly's a nice little thing, so she has fairly normal eyebrows. Remember that usually eyebrows are darker and more defined at the outer edge. No need to make them too perfect at this stage - you will add more detail later. After blocking in the basic eyebrow shapes, I make a rough circle in each eye for the iris. I add the lower lashes, which is quite fiddly, as evidenced here by my less than perfect lines! I'm not bothered though, as after sealing I can go over the white highlight line to neaten it all up. I've added the philtrum - the groove under the nose - by just doing a tiny line in brown pencil. It's a small thing but I think it adds a lot to the character of a face. I thought at this point that her face was looking a bit bare, so I added some faint pink blushing on the nose, and some brown shadow above her eyes. 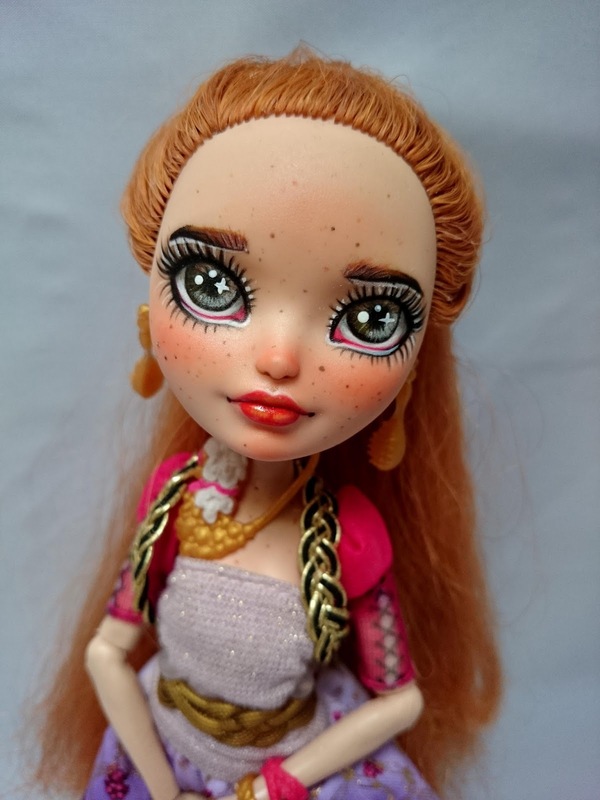 I wanted to keep her eyeshadow fairly simple and autumnal to go with her red hair and freckles. The final thing I do at this stage is draw in the line between the lips, in a pink or pale red. The pencil needs to be really sharp for this or you'll draw all over both lips as well. Here you can see she's kind of starting to take shape, discounting the outrageously messy hair. The biggest difference is obviously the iris colour. To colour the eyes, I like to make lots of lines coming inwards. Irises have lots of different colours in them, so I like to use different colours to reflect that. I've also drawn some faint black lines extending out from the pupil because, well, I like how it looks. Adding white highlights to the eyelashes adds a lot of visual interest, and makes them look a lot more dynamic, in my opinion. As well as eyelash highlights, I've added highlights under the eyebrows, and made the cupid's bow lip highlight more definitive. You can see that I've also gone over the white line under the waterline and made it a bit neater. I've neatened up the eye as well - I went over the sclera in white and now the colour is a lot more definite. I've also drawn in the pink bit in the corner of the eye - which after Googling, I have discovered is called the caruncle. I've also added some light grey shadow to the top of the eyeball, because eyeballs are literally balls, and some shadowing will help to reflect their actual real life shape. At this point, most of the work is done, and the rest of the time on her will be spent neatening and editing, with minor detail work. You can see that I've re-lined the lower lashes again, and made the caruncle more definite by going over it in a darker colour, and defining it with grey pencil. I've also given the eyebrows some highlights on the inner side - this is just done with white pencil cross-hatched very gently over the top. I've drawn her lips in an orangey red for the base colour. Somtimes I don't add much pencil to the pastel at all for a more muted, natural colour, but I wanted to give her some nice bright lipstick. To add the eye highlights, I dip a dotting tool used for nail art in some white acrylic paint, and just dot it onto the eye where I want it. I've also drawn a little cross-shape highlight on the right hand side. You can also see that I've added some more white lines on the lower right hand side of the iris, which adds some interest and depth to her eyes. I've also fleshed out the eyebrows a little (a lot...) which is mostly a personal thing - I love big bushy eyebrows, and have done way before Cara Delevigne made them cool. I'm an eyebrow hipster. Using a pale brown pencil I've added a few paler hairs on the inner side of the brow. On the lips, I've added an orange overlay to match her hair better than the red. The lip highlights are concentrated in the middle of the lips and the cupid's bow. I rub them with a cotton bud so they blend nicely with the rest of the lips. A quick coat of gloss on her lips and she's done! You'll want to seal again before glossing, or you'll smudge all the watercolour pencil into a muddy non-colour. And that's it, really! Knowing when to stop is a bit of an intuitive process and I sometimes get it wrong and over-render the faceup, but that's ok - it's a learning curve after all. A few final words on repainting more generally: it takes time to become proficient at it, unless you are some kind of savant. I actually come from a portraiture background so I was like, 'How hard can it be?' And I guess the answer is that it's not necessarily a hard discipline to master - there's a very steep learning curve - but it's quite different to anything you may have done before. Which I mean really isn't horrendous, but it's very unrefined and clearly the work of a beginner. But that was less than two years ago! And I think it's safe to say I've improved since then. So don't be disheartened if your first attempts aren't anything to write home about. I know it's a bit of a cliché but the most important thing with any hobby is just to enjoy what you're doing. 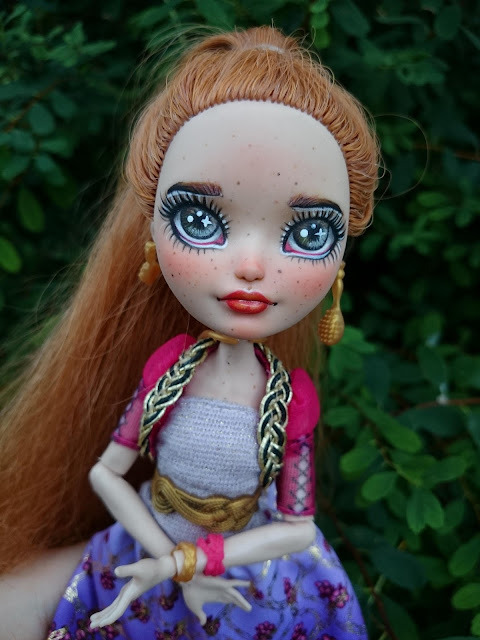 If you have any desire to keep up with my doll stuff on social media, I have an Instagram at milklegsdolls, a Tumblr at milklegsdolls, and an Etsy at milklegs. 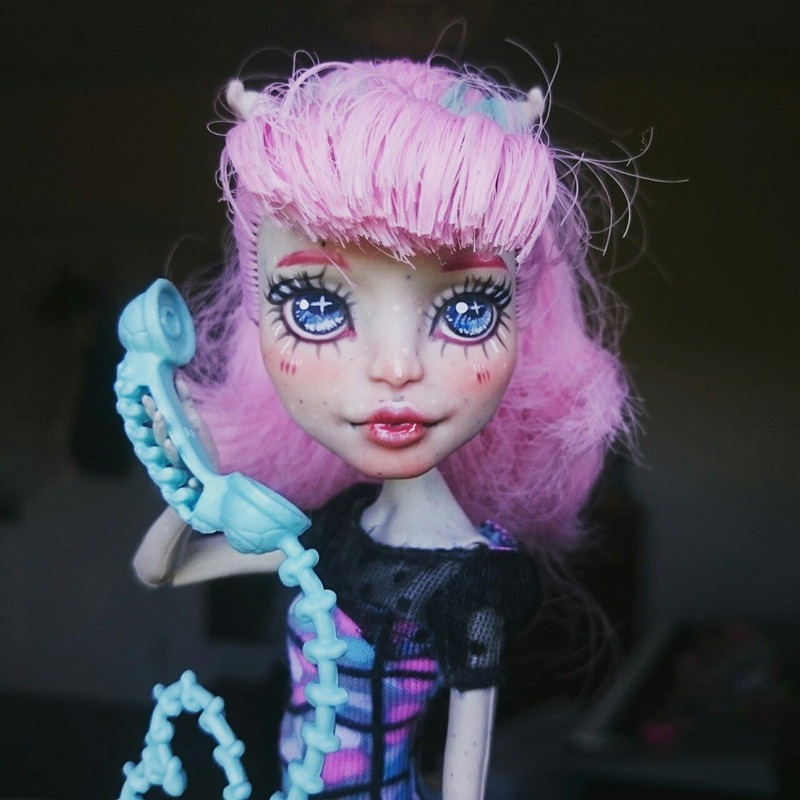 None of my friends are remotely interested in doll talk so I'm always up for intense doll chats with anyone. Thanks again to Emily for letting me write this post! Thank you, Charlotte! I absolutely love this kind of behind-the-scenes glimpse at a project and hope that all of you enjoyed it, too. Charlotte's descriptions even make me feel like I could try this myself someday, although I don't think I'll be messing with acetone or sealant until I've recovered from my last adventure. 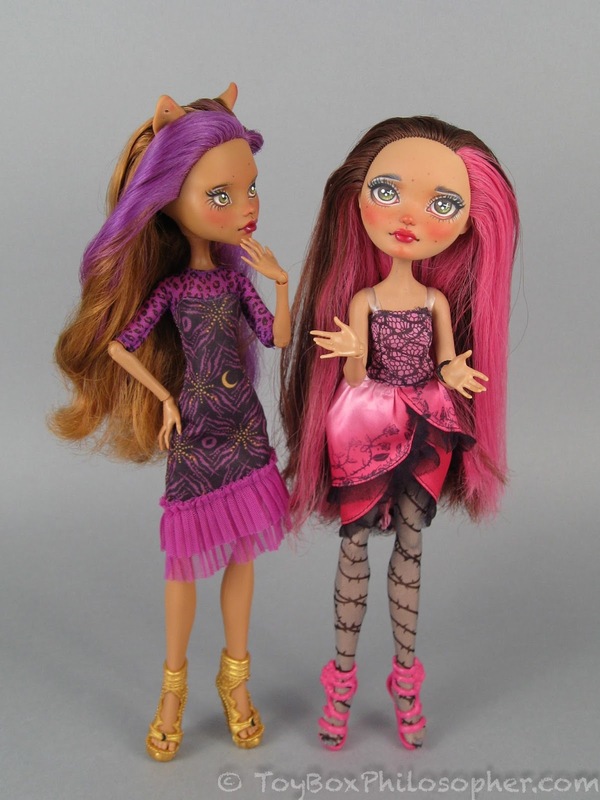 What I would like to do, however, is show you some pictures of the two dolls that I purchased from Charlotte's Etsy shop. 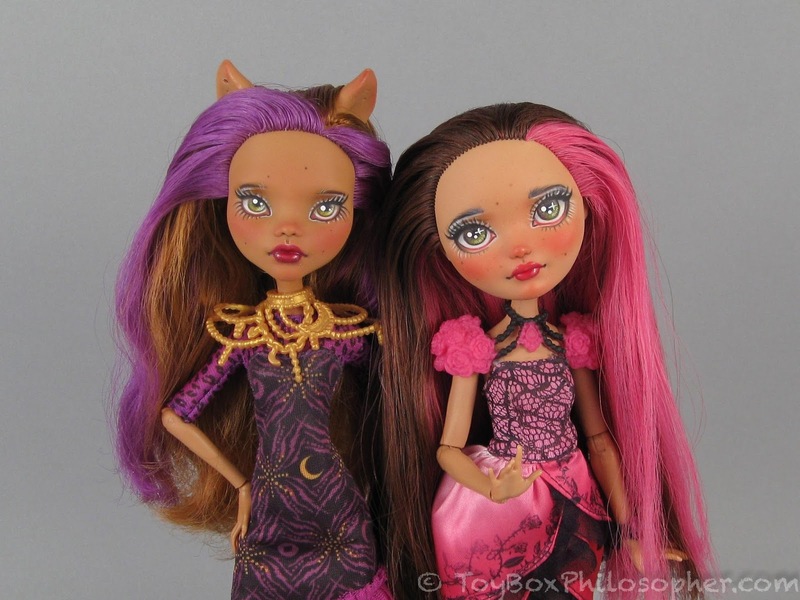 I had a hard time choosing which dolls to buy, but ended up with this particular pair because I don't have Ever After High's Briar Beauty character yet, and Clawdeen Wolf is my favorite Monster High character. And her earrings don't coordinate with anything else in the outfit. I think this texture is from the factory styling gel. The hair is not in its original set, but the greasiness washed right out when I gave Briar a quick boil rinse after the review. Incidentally, the face paint held up to the hair-washing perfectly (sealant is key! ), but I was extremely careful to keep Briar's face dry throughout the process--just in case. No more ruining dolls this week. 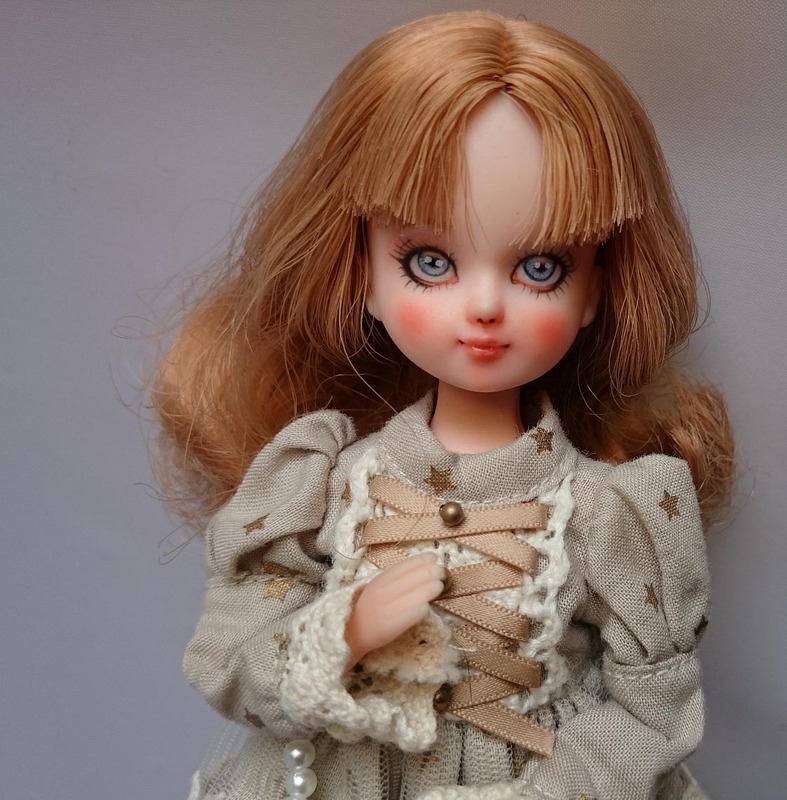 It's so fun to play with this doll's long silky hair and try to find ways of making the streaks of color compliment her rosy cheeks and dramatic lips. After playing for a little while, I tied Briar's hair back into a simple, sleek ponytail to get it out of the way. I really enjoyed carefully inspecting the features of this doll's face after learning about some of the steps in Charlotte's creative process. 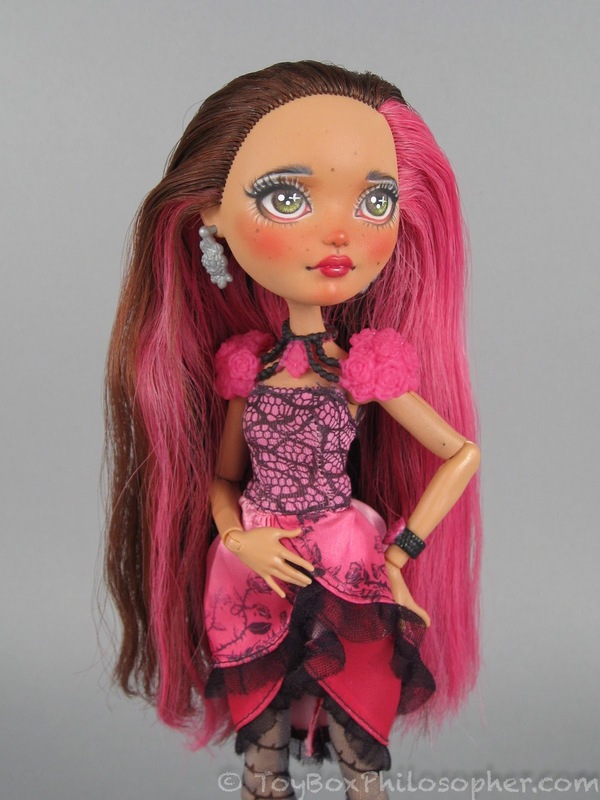 When I first got Briar out of the package, I simply could not believe her eyes. I stood there for several minutes, just staring at her eyes. They seem to have an impossible amount of detail for such a small doll. 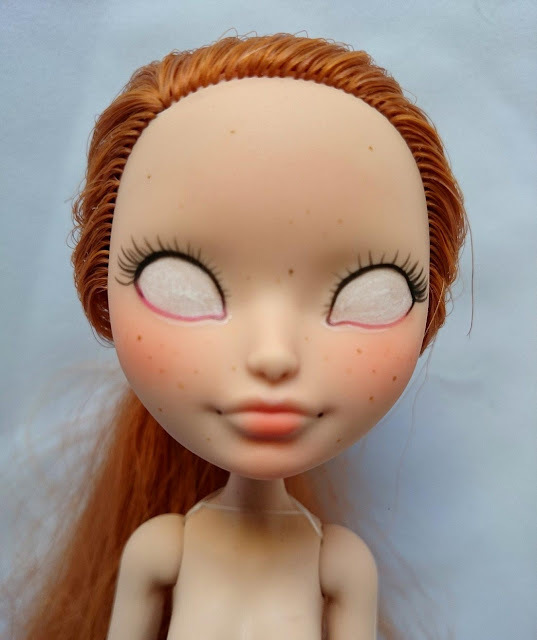 I'll admit to being a little curious about what the eyes would look like with a faint gloss (they'd look like glass, I bet), but I really don't want to risk ruining how fabulous they already look. I think that especially under my bright photography lights, a glossy coat on the eyes could detract from their depth and detail. 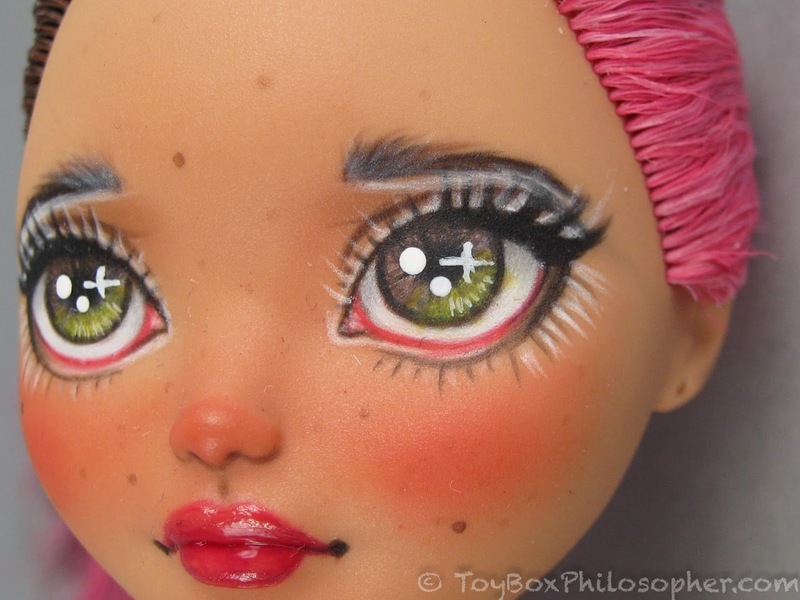 Charlotte offers optional eye glossing on her dolls, but I'm glad that I left mine matte. The caruncle of the eyes is also startlingly accurate--with just tiny hints of highlight and shadow here and there. Look at all of the faint freckles on Briar's face, too--especially along the bridge of her nose. So cute! 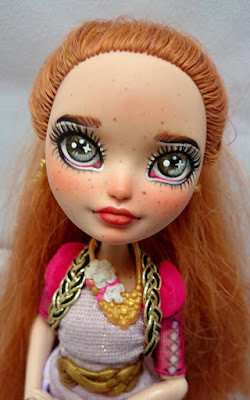 I am such a big fan of freckles on dolls, especially when they're done this well. Those simple lines (along with very faint brown eyeshadow) lend another level of dimensionality to the eyes. They also give Briar a slightly vulnerable look. It's really cool how such a small line can make such a big difference. I adore the shape and rich pink of Briar's mouth, too. The color, shine and shadowing are so much more expressive than the original flat, opaque, pastel pink of the factory doll. 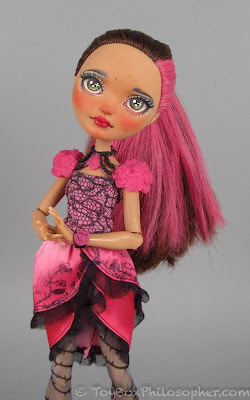 Don't get me wrong--I actually think that the factory Briar Beauty is one of the prettiest Ever After High dolls. She's great, but this repaint takes the character to a whole new level. And she has a little rose bracelet. The thorny tights are great, but the shoes are a little bland--and the heels are too flimsy to help Briar stand up well on her own. Usually Ever After High dolls have good balance when they're wearing shoes. I just love her, too. 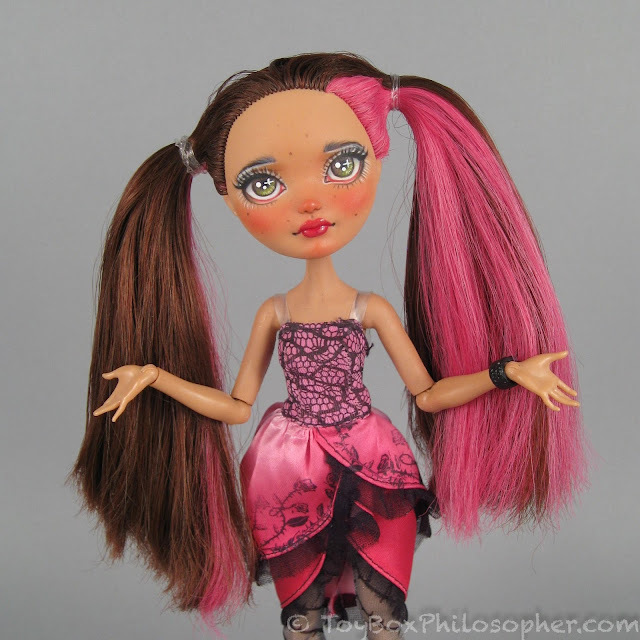 The ponytails also create a division of color in the hair that is really fun to play with! 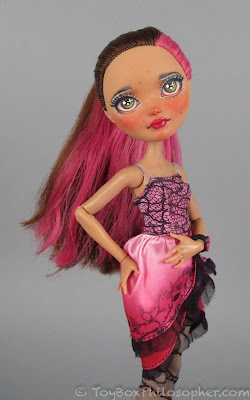 Briar is a gorgeous doll, and I could take pictures of her all day. I worry that she'll spoil me against regular Ever After High dolls, though! 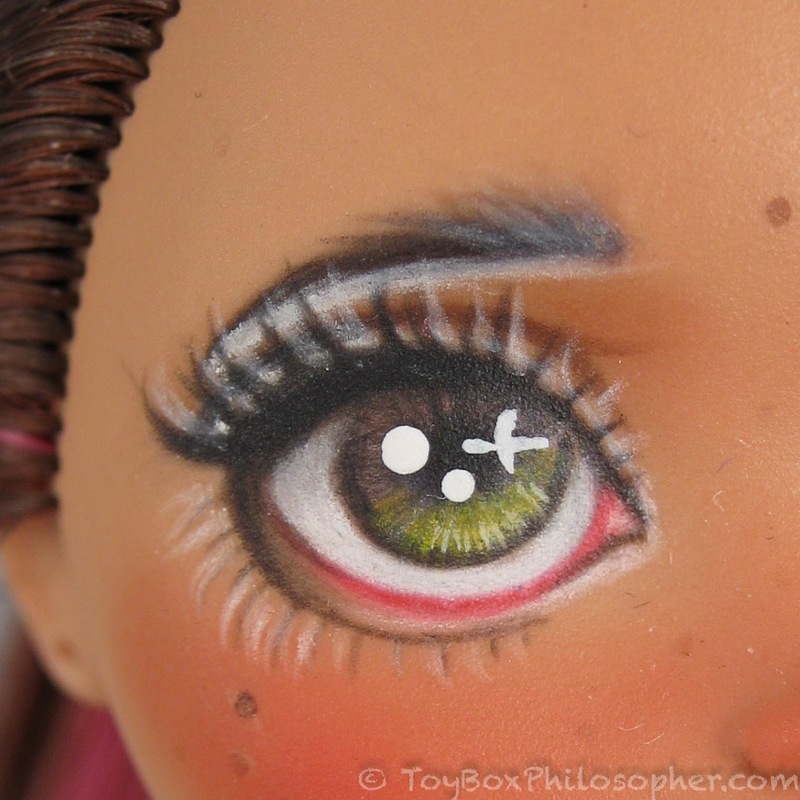 It's so hard to convey in photographs how wonderful this eye detail is for a doll with, at best, a 5mm iris diameter. 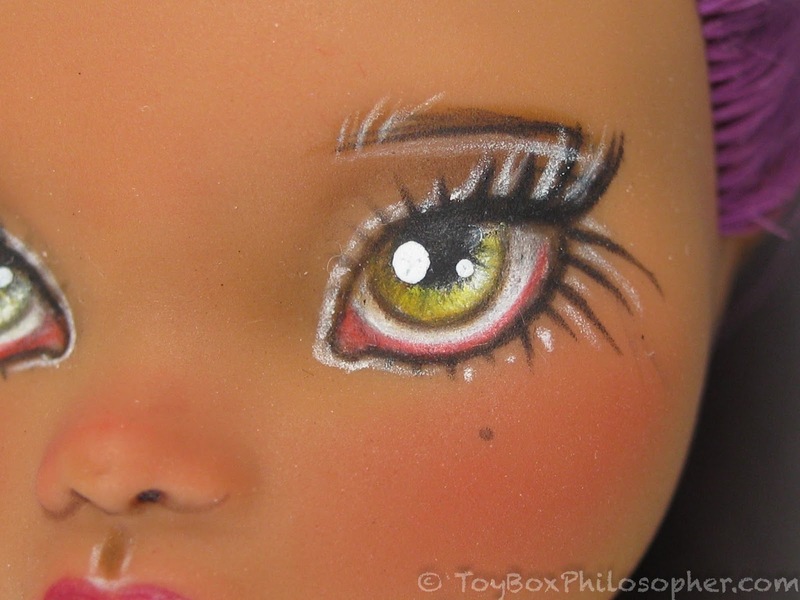 I have always felt that the eyes are the most important feature of a doll, and Charlotte does an absolutely incredible job with eye painting. 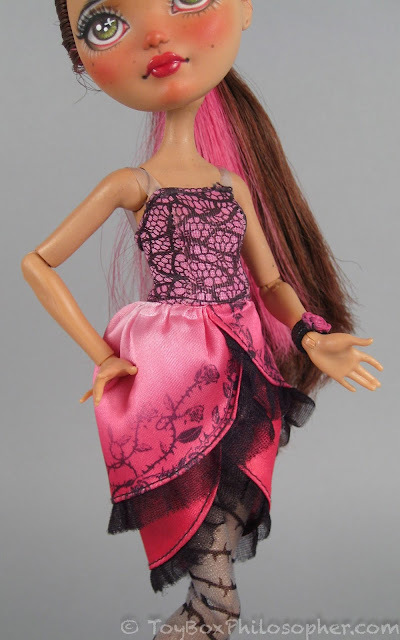 I just love how Charlotte has managed to convey a softly fierce personality in this doll. 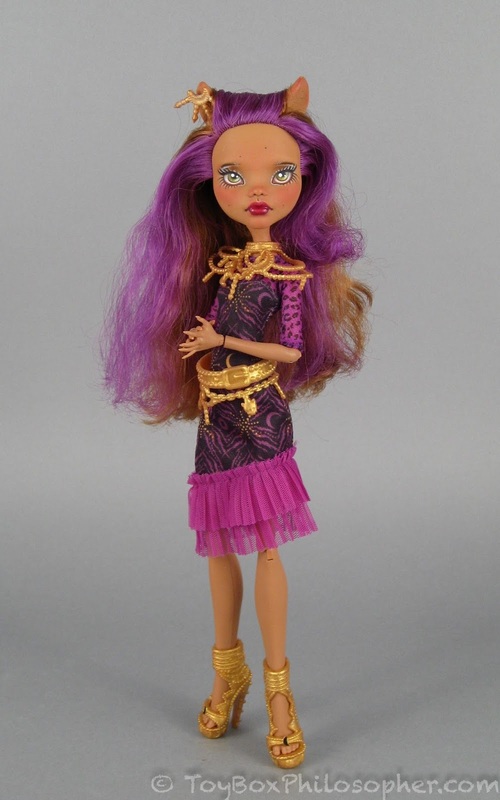 It's exactly how I picture the character of Clawdeen in my head--independent of the television shows and movies. 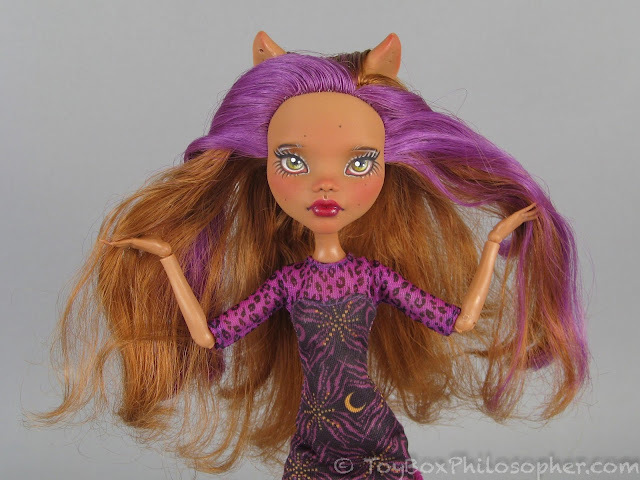 Clawdeen also has a more chartreuse, almost glowing green color in her eyes--not the soft hazel of Briar's eyes. There are a few stray bits of lint trapped in the gloss of Clawdeen's lips (just like Charlotte said) but it's impossible to see this without the zoom lens of the camera. She wears a gold vinyl shoulder piece and a matching belt. The shoulder piece slips out of place frequently and the belt is always hiking up. 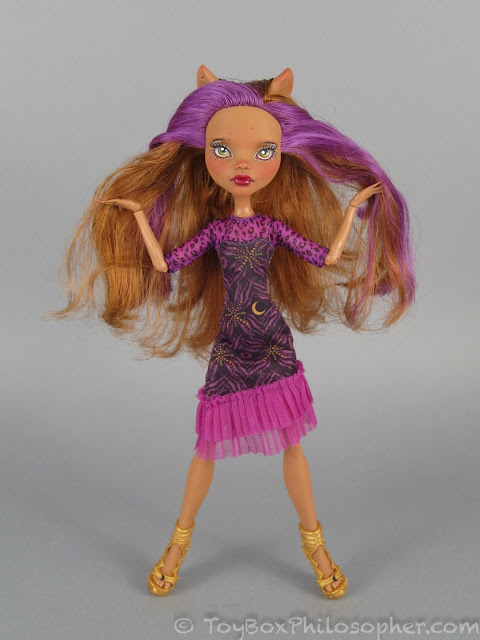 I'll need to find Clawdeen a more elegant outfit that is worthy of her face. A plain black dress, for example, would make her electric green eyes look amazing. At least now I know that there's quick fix for this...when I finally get up the nerve to unleash the acetone. 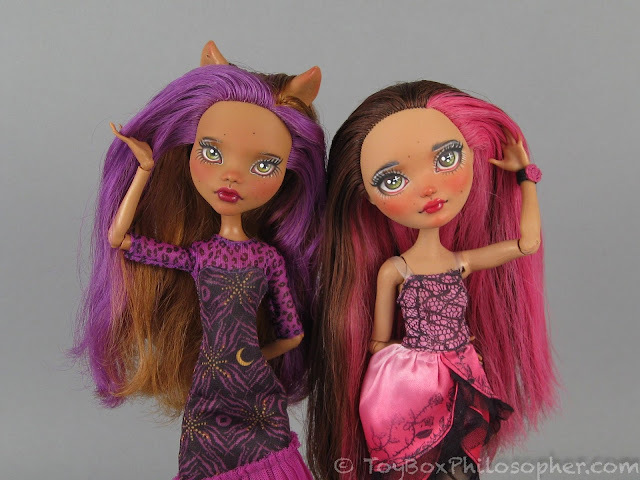 I would like to thank Charlotte again for coming to the blog to share some of her techniques and materials with all of us, and also for painting these two amazing dolls for my collection. Briar and Clawdeen have taken their places on my Monster High and Ever After High Shelf of Awesome, along with the likes of Avea Trotter, the first edition Clawdeen, SDCC Frankie, and my un-boxed debut Toralei. Lofty company, indeed, but these two fit right in. What a great feature. I just attempted my first repaint ever and it didn't turn out the greatest. These dolls are beautiful! It must take a lot of time and practice to get that good. Your repaints are breathtaking, Charlotte! Thank you so much for sharing how you create them. I especially admire those who do doll face-ups since I've tried it myself a few times--far from easy! Not to mention all the strong smells, you're right Emily! Dangerous to those of us who have a tendency to accidentally choke ourselves. ;P Thank you both for sharing these gorgeous girls! Yes, I'm thinking that you and I should stay away from any kind of fume right now, Melissa! ;) Repainting is a lot harder than it looks, I agree. I've tried a few simple face-ups, and I feel like I need a huge magnifying glass just to see everything well enough to make the tiny details! Wonderful guest post - Charlotte, you've done some beautiful work, and Emily, thanks for sharing it with us! 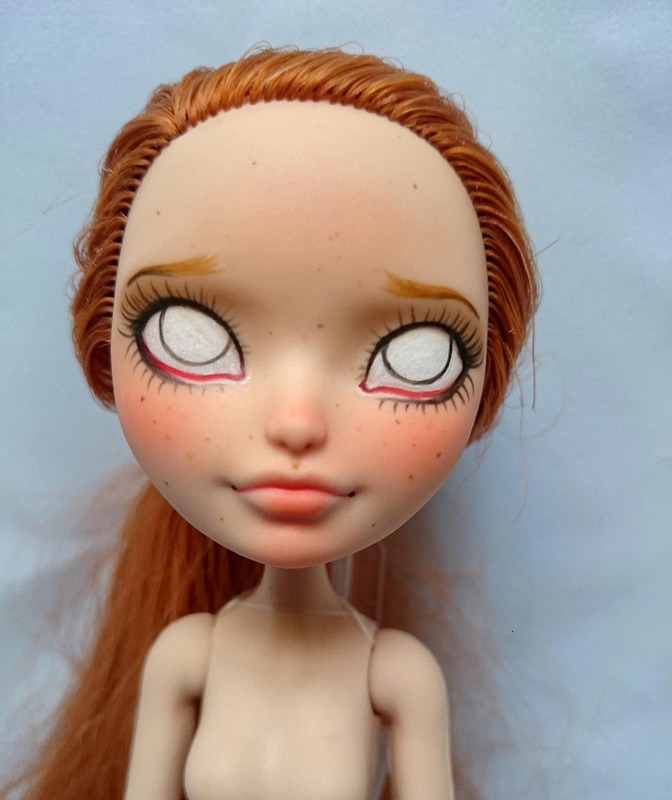 I love seeing the magic behind a customizer's process (or any doll artist's process, really). Can anyone explain to me this style of blushing? I see it on 95% of repaints and I don't understand why everyone does it! I don't buy that it makes the dolls look more human because no (healthy) walks around with a red nose and chin. The irises are very lifelike though. For me, the blushing is just an aesthetics thing rather than a realism attempt - I like the look of little pink faces, I find it really charming and endearing. It's not everyone's thing though! But I am also the same as Emily, I always have a really pink nose! When it comes to dolls, animation, etc., making things TOO real enters uncanny-valley territory, which unsettles most people. Most of us DO have more tint to our cheeks and noses and chins, and the way to show this on dolls without getting uncanny is to exaggerate it a bit. 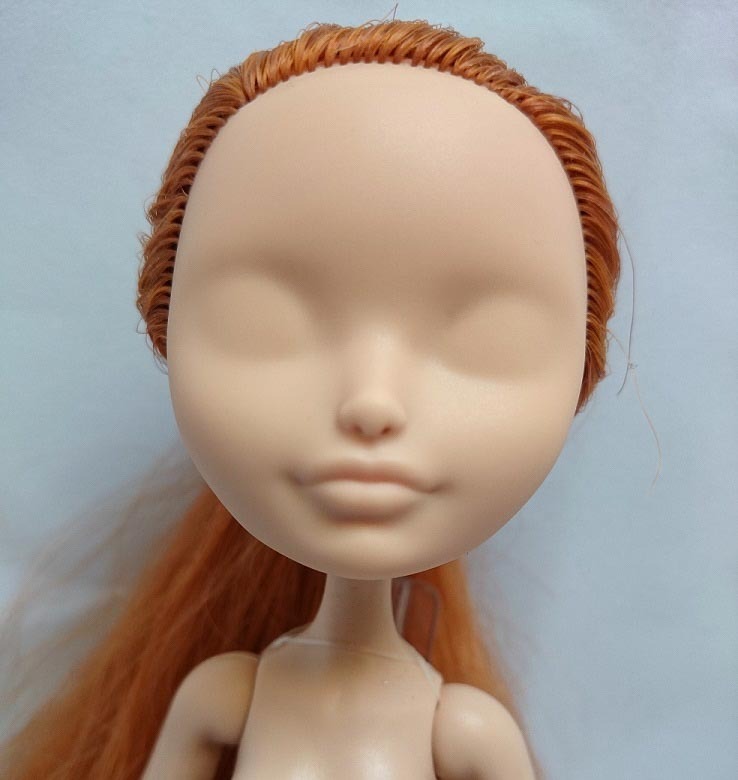 Another example of how things are altered for dolls is the hands. Realistically-sized hands look HUGE, and even hands that are 75% of typical for a human (chin to eyebrows is about average) look big. So doll hands are extremely small compared to reality. Lovely repaints - but does anyone else find the harsh white lines around the eyes and eyebrows a little jarring? They take away from the subtlety of the rest of the face. Hi Georgie, I think this is a case where my up-close pictures aren't doing any favors. The white can look a little funny on the zoomed-in shots, but I would say that at a distance, and at real size, it just adds some three dimensionality or "shimmer" to the lashes. A lot of art is like this, I find--where the up-close view is different from the full effect. It's definitely a different approach than what is used on some other repaints. Always fun to see another repainter's process! Everybody's style and method is slightly different. MSC scared me off with its health hazard labels, so I've been using the Liquitex brush-on sealer. It's a bit too shiny, and like you said you can't use it on top of watercolor pencils (or wet paint), so it's not ideal but it can be done. Something I learned the hard way with acetone is, if you rub it too hard the vinyl will dissolve slightly and get white and porous, so be careful of lips and noses! Thank you to Emily and Charlotte for this great post, I really do love 'makeover' posts and aspire to try something like this one of these days. I have all the stuff, it's just a matter of practice! I love the girls new faces, they are so incredibly cute looking and I'm not even a Monster High or Ever After High fan!! But I certainly love these two. These are gorgeous! Just a note on chemical safety- a respirator mask will work wonders for keeping the fumes away, and the $30-$60 price range is worth it when it comes to your health. Also, if you have brush-on Liquitex sealant and no airbrush, gently sponging it on works well, although it takes longer to dry than aerosol sealers. Did I miss the brand of watercolor pencils you used? I use a mixture but as long as they're artist quality (not student) then you should be fine. I use faber castell and derwent. Derwent pencils are softer so make more vibrant colour in my experience but that's not always what you want! I love these repaints.Thank-you to you both for sharing the information and the photos with us. The attention to detsil is amazing- Clawdee's eyebrows even start with fine ones on the inner corner. 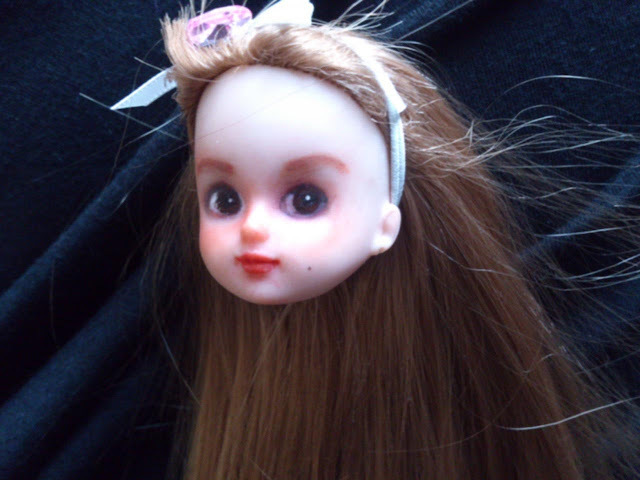 On such a tiny face, but then the second Licca is so pretty and that face is even smaller. Anyhow, great work!